In this review I am going to talk about Vivel’s newly launched cleansing cream face cleanser + scrub. 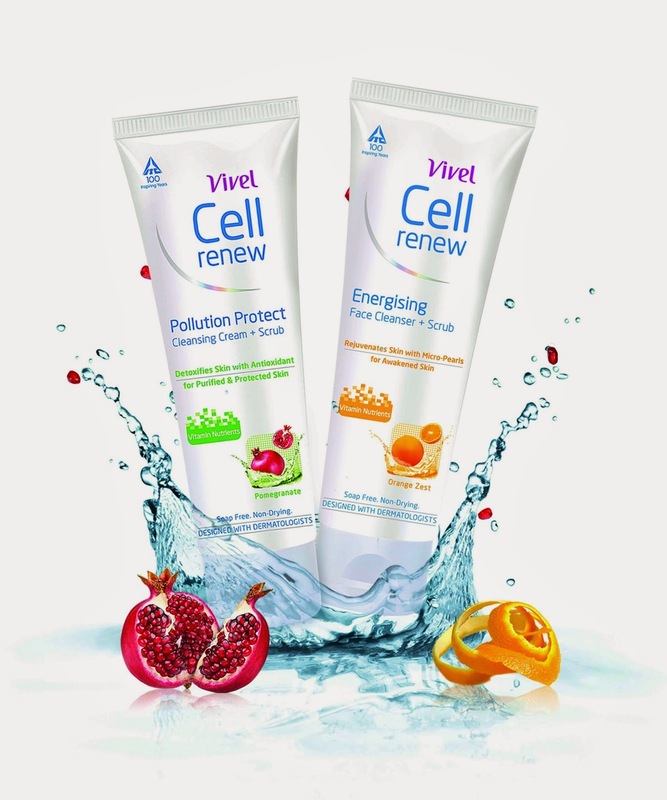 This product is from the expert range of face cleansers from Vivel Cell Renew designed to fight various sources of causing damage to skin on daily basis. It was gifted by a friend; I received a well packed box with 2 variety of cleansing cream face wash + scrub. "It protects skin from pollution damage. Powered with known antioxidants like Pomegranate extracts and Vitamin E, it detoxifies skin by neutralizing the free radical effect of pollution, thus keeping skin protected. The unique cleansing cream + scrub format purifies skin to remove the accumulated pollutants from your pores. Cell Renew Pollution Protect face cleanser hence keeps your skin purified, protected and nourished." · Creamy texture cleans the skin effectively. · Gentle scrub, can be used daily. · Milky white in color & crème based. · Forms creamy foam and washes off easily. · Soap free & don’t over dry skin. · Contains vitamin E to nourish skin. · Contains pomegranate beads for detoxification of skin. "This is specially designed for evening use. Energizing Face cleanser rejuvenates skin after a long stressful day. Infused with Orange Zest and Micro Pearls, this face wash has an energizing action that removes sebum and stickiness to alleviate signs of day-end dullness for rejuvenated and awakened skin"
· Covers up facial dullness & stress. · Orange zest removes excess oil. · Transparent in color with orange beads, seems to be gel based. These cleansers are meant for everyday use and thus their exfoliation is not enough to counter blackheads. Rating: 4/5Though it is a great idea to have made these face-washes for day and night time use separately, I think I am going to use Cell Renew Pollution Protect cleansing cream face wash in winters & Cell Renew Energizing face cleanser in summers. Repurchase: Yes. I wouldn't mind. Yes, Nivedita the product is very mild & good to go for acne prone skin as well.. I was waiting for a review on this product.. but I'm not sure if its worth a try though.. I prefer using Neutrogena :) What do you say ?? I'll try these too! Winters is making my skin really rough! sounds great :) nice review hun!